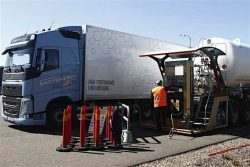 Spain’s HAM Group was selected by Volvo Trucks to provide a liquefied natural gas (LNG) mobile unit with the objective of refuelling its Volvo Gas Power trucks during the last Test & Drive event that took place in Hellered (Sweden) in April and May, near of the facilities of the Gothenburg truck manufacturer. The HAM mobile unit has a capacity of 30m3 and meets the requirements for the filling of Volvo trucks. The refuelling operation was carried out by means of a single supply hose that alternates the LNG filling operations as well as the depressurization of the generated boil-off. An average of ten trucks per day were supplied in an easy, practical and safe way for drivers, a depiction of HAM’s product philosophy. HAM Group was likewise selected to supply LNG during Volvo Test & Drive events at Castellolí, Barcelona in October and November 2017. Currently, the HAM mobile station has been moved to another point in the Spanish geography to continue supplying LNG and compressed natural gas (CNG). The company has been developing vehicular natural gas (LNG / CNG) solutions for industrial vehicles since 2000, contributing to the reduction of CO2, NOx and particulate pollutants to improve the environment. Last week, HAM Italia and fuel supplier C. Galdieri & Figli together inaugurated the first LNG filling station in Campania (Italy) with an innovative system, the first dual LNG hose dispenser in Europe. 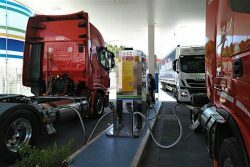 Two trucks can be simultaneously refuelled from the single dispenser designed by HAM Italia.. The station is located at the exit of the Salerno-Avellino Baronissi motorway and is the first LNG station in southern Italy. Source: HAM Group, an associate member of NGV Global and member of NGVA Europe.